The so called New Weird Greek Wave Cinema has already been around for five years since it was introduced to the public with the film, “Dogtooth” by George Lanthimos. It distinguishes itself from other film waves with its extremely stylized frames and the peculiar way in which the camera moves around cinematic space. After a great success in international film festivals, an award in Canes and the notorious nomination for the Oscar awarded to foreign, “Dogtooth”, it became a divisive film for both critics and the audience, with its different style, that recently became an entire new film wave. Lanthimos actually set the pace for many young Greek directors who followed his innovative league in their attempt to find a new specific voice in the era of the economic crisis. Reclusive and isolated social groups, with specific rules and a tendency for confinement are certainly the center of Lanthimos movies. He uses his actors in an innovative way, directing them to play as unrealistically as possible, in a way that reminds us of marionettes or robots who are not yet really aware of the element of speech and thought. Every frame is designed and stylized strictly, to a great extent where the camera stays motionless in space, after being set in a carefully thought-out position, where the only movement comes from the actors playing in the scene. In this unorthodox way Lanthimos is trying to introduce us to his unique utopian environments and isolated social groups. 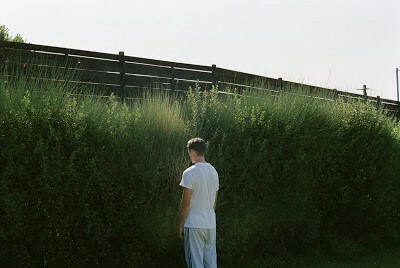 In his first movie “Dogtooth” the epicenter and the only space of action is a secluded house located on a typical Mediterranean landscape. In this house that is secluded from the outside world with high garden fences resides a strange family. The children of the family are never allowed to leave the house and their family home is their entire known world. With the strictly stylized frames, we are allowed to sink into Lanthimos universe. The extremely refined and visually efficient frames define the secluded environment of the house even more, allowing the viewer to experience a sense of claustrophobia. There is no exit or savior from the enclosed residence or whatever meanings this sense symbolizes for each and every one viewing this film. The house turns into an apolytarchic center, where the “father” is the dictator. Everything starts and ends according to his wishes. The borders are not accessible by anyone, the intruders are unwanted and must die, while whoever is “inside” is forbidden to get “outside”, except for the father or the dictator himself. “Dogtooth” introduces a game of borders, which enhances the idea of spatial dipoles. It is in short, a study on social isolation and embarked spaces, where the meaning of the “house” is transformed from a shelter into a space of imprisonment. Lanthimos creates his own utopian universe, which is full of theoretical and architectural extensions, left wide open to different interpretations according to the viewer’s background. In his second movie “The Alps”, Lanthimos chooses to focus again on a secluded social group, named after the famous mountain range. The members of the team have to abnegate themselves, in order to replace dead people in their grieving families. The social group called Alps, like the family in “Dogtooth” obeys certain rules, which are defined by the leader. This time the frames wander in a larger space range, inside the city. The hospital, a lamp shop, the beach and many different houses are some of the spaces where the members of the “Alps” are allowed to move with their new identities. Despite the set range, the cinematic images do not miss any of their strict stylization and the camera remains completely still between frames, in which only the dramatic action takes place. The group gatherings occur in the “gym”. There and only there are the members of the group allowed to be themselves and not the person they portray. Inside the gym, we meet again the distinct borders “Dogtooth” introduced to us. A closed and secluded space with no openings, is organized by strict rules and the leader dominates the rest of the group. The members are allowed to train, discuss their work and communicate with each other while they arrange the matters of “daily business”. The gym receives a new meaning, turning from a space of exercise and recreation into a space for personal advancement, full of hidden dreams and desires, a claustrophobic environment regulated by the unknown and strict rules of a secret group. In his third movie, “The Lobster” Lanthimos has managed to escape from the barriers of the Greek industry and introduces us to an international cast and production, without abandoning his idiosyncrasy and special style. The peculiar plot takes place in a dystopian society in the near future, where according to the rules of the City, whoever breaks up with his partner and is alone must be immediately arrested and transferred to the Hotel. This is where they have to find a pair in 45 days, while taking part in different social gatherings as well as in the Hunt of the Loners who live in the forest. For every Loner they kill, they earn one more day in the Hotel. If they fail to find a partner after the end of their stay, they transform into an animal of their choice and are set free into the forest. A Man escapes from the Hotel and joins the group of the Loners, where he falls in love with a woman, although that is against the rules. Both the Hotel and the Forest are regulated by strict rules (like the House and the Gym in his previous movies), this time though the rules are trying to regulate matters of love and loneliness. In this movie Lanthimos is constantly trying to answer the question of what love is really all about and at the same time deal with the problem of loneliness, through a hard and distant way of filming. The surrealistic universe Lanthimos is using in this particular film has a way to depict our biggest fears and the deepest truths about loneliness, with all our innermost and intimate thoughts being constantly projected through his robot –like heroes, who deny to filter their notions and motives. The plot as an entity is an allegory, while the heroes seem to be trapped between the rules and the situations that regulate their lives. In this sense Lanthimos movies are contemporary ancient Greek tragedies, where rules and social leaders take the place of the gods. His heroes are like pawns in his movie games, moving inside strong and strange surroundings, without the right of free will. The way the actors speak, move and react with each other are set in a way to make this essence even more distinct. The “frozen” performances of the actor’s combined with the innovative cinematography have the tendency to mesmerize the viewer. Sometimes this certain way of performing can make the viewers feel uncomfortable or even embarrassed, in the end though the whole procedure is inevitably disturbing. That is the main reason why Lanthimos’s movies are not highly appreciated by mainstream audiences. However his movies are much more popular with cinefil viewers, film critics and committees around the world. In the end, the interactions of people in secluded social groups and spaces are the main issues that concern Lanthimos, both in terms of script and direction. He is trying to create new utopian environments, where he can place his own soulless heroes, who move and interact like puppets. In this way he is experimenting with contemporary film-making and the ways people react, while creating a wide range of metaphors and raising multi-faceted conclusions. A variety of interpretations are available to whoever is willing to receive and understand them. Lanthimos’s film world and cinematic view are undoubtedly special and unique and that is why he is internationally acknowledged. The stillness of the camera, the stylized frames and the use of enclosed spaces in his work, dignify his films with a new spatial aspect. Moreover his innovative way of filming has inspired many young directors, creating the New Weird Greek wave cinema. Athena Rahail Tsagkari is another director, also a friend of Lanthimos. “Attenberg”, produced in 2009 brings up a lot of memories from “Dogtooth” in both matters of aesthetics and directing. It is not by luck that Lanthimos himself plays a part in the movie. “Attenberg” tells the story of a girl who grows up with her father, an architect, in a secluded seashore industrial housing complex. She discovers the outside word trough the documentaries of Sir David Attenberg and her interactions with her friend Bella. Her father, who is dying of cancer, is constantly speaking about the death of modernism, while expecting his death to arrive. Until all changes when an unknown alone mechanic arrives and Marina starts to discover her sexuality. . Athina Raxail Tsaggari creates a strictly stylized environment that is enhanced with melancholic photography with the winter sea aura dominating the movie. Her movie is lyrical and sensitive, speaking about coming of age and the always present death: the death of modernism, the death of childhood, and the death that slowly comes to all human beings. Her references to modernism are always present not only through the moribund architect (who is dying together with the modernism era) but also through the perfectly chosen abandoned urban industrial complex that slowly vanishes in the sea mist. The movie takes place in an urban industrial complex, called “Aspra Spitia, designed by the renowned modernist Greek architect Doxiadis in 1961. It was designed for the needs of the Greek company of Aluminum in order to host 5000 employees who worked in the production and the management of the new factory of a French company. It is the only example of modern urban design in Greece and it is a city that was designed from scratch to accommodate the needs of the new factory. The strict urban design, the modernistic simplicity of the white house’s overlooking the sea and the aluminum factory covered with red soil, create an impressive cinematic background. What is impressive about this choice of setting is the sense of utopian space, which defines the new Weird Greek Wave. The white house complex, inside its modernistic simplicity, could be any industrial urban housing complex, anywhere in the world, overcoming the borders of its Greek identity. The approaching death, the birth of sexuality, the end of the industrial era and the modernism are all matters universally accepted, without borders. The specific architectural space turns into a utopian non-space, to adjust to the film’s needs. Using such a neutral setting, she is trying to speak about decay of the industrial way of living and the viewer is forced to identify with the bourgeois modernist heroes, who are trying to rediscover their known world. Another great example of Greek Weird Wave cinema is the film “Miss Violence” by Alexandros Avranas that was awarded with the Silver Lion for direction in Venice Film Festival, 2013. The movie is distinguished for its cruel and harsh plot and the special filming identity of the director. The movie starts with a birthday party of a girl, where the entire family is gathered and takes photos. A few minutes later the birthday girl, commits suicide by jumping from the balcony, smiling. Death as a beginning and an ending uncovers the story of violence that leaded to the suicide. The spectator views the violence of silence, through locked doors of a middlebrow Greek family. The camera observes and records whatever happens in the family house and penetrates into the source of the problem, in order to slowly but surely reaches to the liberating catharsis of the finale. The frames are deliberately stilted and motionless, permeating into the family house and the sacrum of the holy Greek family. The typical Greek apartment is the main setting of the movie. Three generations grandparents, mother, and children coexist with everything this sort of co-living entails. The 70s aesthetic and the old heavy wooden furniture dominate the house. The camera remains once again motionless, while following through the openings on the walls the carefully choreographed movements of the family, in order to slowly reveal to the viewer, who by all means remains a spectator, the ugly truth that he wished to avoid confronting during the entire film. A keyhole, with excellent aesthetics in order to secretly spy on the anatomy of violence in an outward usual Greek family, is what Avranas’s movie has to offer. The viewer is addicted to the game the direction provides and slowly reaches solitude by the end of the film. This sense of solitude and catharsis creates a distinct reference to the ancient Greek tragedies. At the same time though the movie remains universal as a whole, providing us with a family situation that could happen anywhere in the world. Neither the aesthetics of the family house nor the relationships within the family members have a specifically Greek identity. Although the film uses the Greek language and the elements of a Greek tragedy it is targeted to an international audience because of the universality of the theme. In conclusion, Greek Weird Wave is actually an upcoming film wave, with Greek directors trying to find a new identity which can be more appealing to international audiences. The plots have all a sense of commitment and confinement, with the heroes being subjected to certain rules or situations above their powers, reminding us of their origins in Greek tragedies. Other distinguishing features of the specific film wave are the stillness of the camera and the extreme stylization of the frames to an extent that is almost unrealistic or reminding us of paintings specifically on the spatial aspects of this film, we have noted the use of secluded enclosed spaces and the tendency to create utopian environments with universal aspects. Young Greek directors are trying to define themselves with a more lyrical and aesthetically adequate way of filming, where the cinematography becomes an important part of the film making process. At the same time without abandoning their Greek idiosyncrasy, they are trying to enhance with a dramatic and abstract way. Although weird Greek wave is relatively new we cannot wait for the featured films it holds for the international audience. Thoughts on movies, architectures, spaces, places, artworks, artists, feminism, colonialism, capitalism and how smartphones make us dummies. Here you can find some of my articles, research and work that has already been published in Greek, translated in English just for you !